Sprouting of grains and lentils is a healthy practice, as it increases the amino acids and vitamins. I read an article in Wikipedia that says after sprouting, the protein and vitamins increase to a considerable amount. 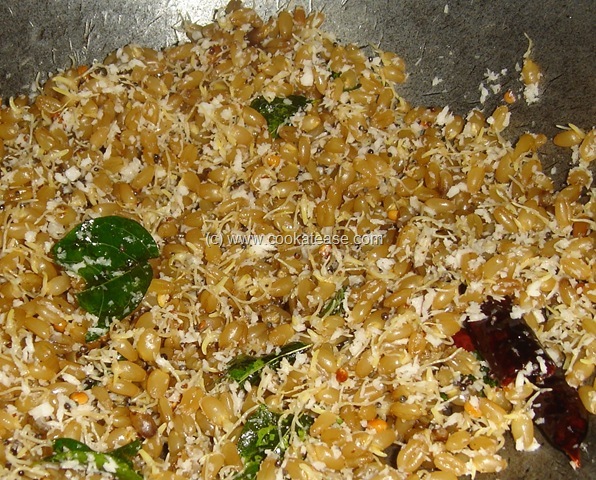 Sprouted grains are fully nutritive as all parts like germs, brans and enzymes are still in them. Sprouting also helps to easy cooking and digestion. The only drawback is sprouting takes time and in case of wheat berries it took 2 to 3 days to sprout. 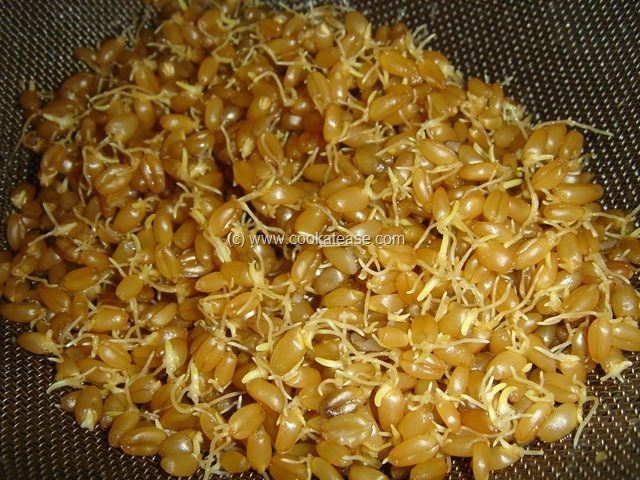 Sprouting can be planned and can be included in our menu at least thrice a week. This is high time to introduce it to our younger generation. I used to sprout many varieties of grams and this is the first time I tried to sprout wheat berries. I sprouted them in traditional method. Soaked for overnight, tied in a cotton cloth and kept in open air. Rinsed them twice a day and sprayed water in between. On 3rd or 4th day, I got nicely sprouted wheat berries. 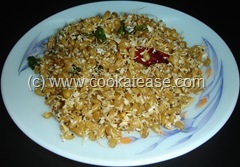 I cooked sprouted wheat berries as sundal for an evening snack. It took hardly 3 to 5 minutes in boiling water to cook them soft. 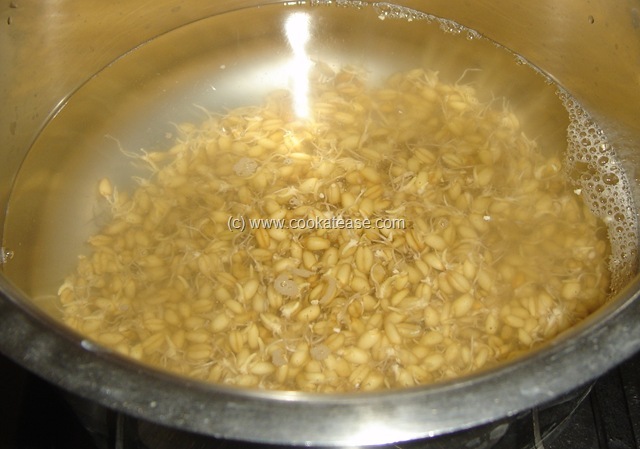 Boil water, add sprouted wheat berries, lower the flame and keep for 5 minutes; switch off gas, add salt in boiled water, mix well and keep for 2 minutes; then drain the water. 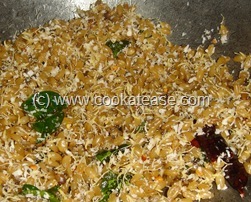 Do the seasoning in a pan, switch off gas, add boiled sprouted wheat, grated coconut and mix well. 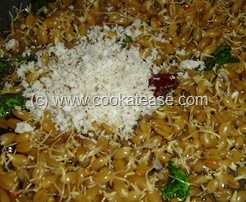 Delicious Sprouted Wheat Berries Sundal is ready to be served as a snack. 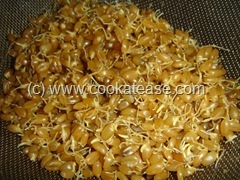 While cooking wheat berries, stir/mix gently and take care not break the sprouts. 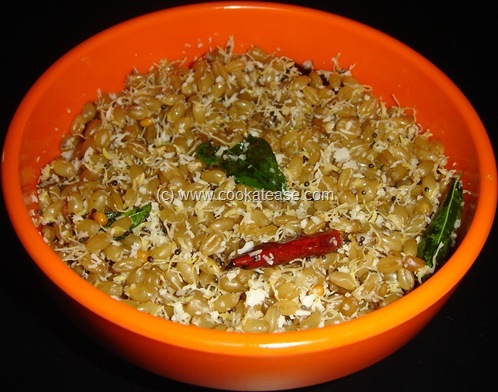 Sprouted wheat berries can also be used in Kosambari – sprouted green salad. This post is part of the event Health Nut Challenge 2: Guilt-Free Snacks hosted by Health Nut. Definitely a delicious and healthy wheat berries sundal..